See Moscow through the eyes of locals on this 3-hour off the beaten path walking tour. Uncover the little-known treasures of the city like the elegant Pashkov House and the legendary Krasny Oktyabr confectionary factory, admire Gorky Park and Muzeon Park of Arts. Feast your eyes at the Christ the Savior Cathedral and Pushkin State Museum of Fine Arts and stroll through the oldest Moscow streets, beautiful bridges and picturesque embankments. Don't miss a chance to take a photo at Crimean Bridge, a very instagrammable spot. Learn fascinating facts about places and get an insider’s tips from your expert guide how to enjoy the rest of your day in bustling Moscow. Indulge in delicious coffee with dessert, and have a Russian lunch if you opt for a 4-hour tour. 10am Start your entertaining and informative trip, meeting your guide in front of the Pashkov House, one of the most famous classic buildings in Moscow. Get spectacular views of the Kremlin. 10.30am Wander down one of the most ancient Moscow avenues – prominent Volkhonka Street, and see the Pushkin State Museum of Fine Arts from outside. Pass by Gallery of arts of Europe and America of 19th-20th centuries and Moscow State Art Gallery of Soviet artist Ilya Glazunov. Eye up to magnificent exteriors of the former mansions of Princes Golitsyn and Naryshkin as your guide entertains you with tales about life of noble families. 11am From there continue to Christ the Savior Cathedral, a symbol of the great victory of the Russian people over Napoleon in the Patriotic War of 1812. 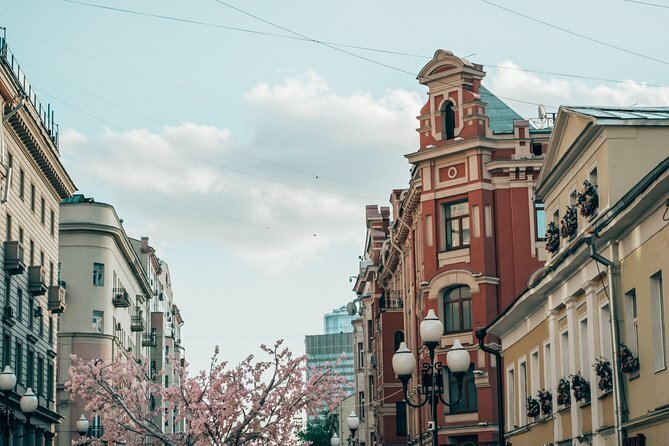 Marvel at the outstanding white walls and golden domes and learn more about Moscow’s nicknames. Immerse yourself in an amazing spiritual atmosphere in impressive interiors colorfully decorated from floor to ceiling with icons of saints. OR choose Old Arbat street instead. Next, cross the Patriarch Bridge, enchanting pedestrian bridge where you’ll be wowed by stunning views over the Kremlin and Moskva river. Enjoy incredible selfies and then venture to Krasny Oktyabr, prominent former confectionary manufacture whose parent company was 17th in the list of the largest candy companies in the world. Take a look at the Peter the Great Statue, a magnificent 98-m high creation of Russian-Georgian artist Zurab Tseretelli and one of the greatest art works in the world. Head to Muzeon Park of Arts, a perfect photo-op and a lovely green oasis. Take a free yoga class or check out a flea market. Get impressed with the largest open-air sculpture museum in Russia with more than 700 Soviet era artworks currently on display and take a glance at the Brusov ship docked nearby which is famous as a voguish cluster of trendy shops, restaurants, cafes and bars. 12.30pm Drop in at one of the coziest coffee shops with river and embankment views, and enjoy refreshing drink. Take in the beautiful views and listen to your expert guide’s stories about former Soviet heroes like Lenin, Stalin and Brezhnev, or simply ask your guide about present-day life in Russia. 1pm Finish your tour at Gorky Park, one of the most popular places among locals in Moscow. Enjoy Moskva-river views and go people-watching. You might want to spend an entire day here walking through musical fountains, bar crawling, and checking the Garage Museum of Contemporary Art. 1-2pm Have a Russian traditional lunch if you opt for a 4-hour tour and see more of local hidden gems and nature nooks in the heart of Moscow.